This SABRE Red Pepper Gel New User Kit with Pepper Gel, Practice Gel & Target helps you get acquainted with pepper gel by including a practice spray water canister. The practice gel features the exact same deployment style and firing mechanism as its pepper gel counterpart to help you gain muscle memory and confidence so you can better protect yourself and your family during a high-stress encounter. Boasting the same police-strength protection you’ve come to expect from SABRE, our pepper gel also offers additional benefits. To maximize your comfort and safety, pepper gel virtually eliminates wind blowback with no in-air atomization, meaning it only affects the target/person it directly contacts. Gel also offers a 20% greater range than traditional pepper spray - this model sprays 12 feet/4M. It’s also safe to use indoors, as it won’t spread through HVAC systems and is designed not to affect others in the immediate area. You benefit from protection against multiple threats when you choose this product, which contains 25 bursts (5x more than other brands). This pepper gel features a flip top safety mechanism to prevent accidental discharge. The durable key case features a finger grip for enhanced aim and product retention. Providing the world’s most reliable protection, our maximum strength pepper gel is backed by our exclusive in-house high performance liquid chromatography (HPLC) laboratory, which eliminates the 30% heat failure rate experienced with other pepper spray brands (Source: University of Utah). This technology is the only way to ensure there are no pepper spray failures on the basis of heat inconsistency. Our HPLC technology is the industry’s #1 advantage - and it’s exclusive to SABRE. Your pepper gel will contain maximum stopping power when you need it most. 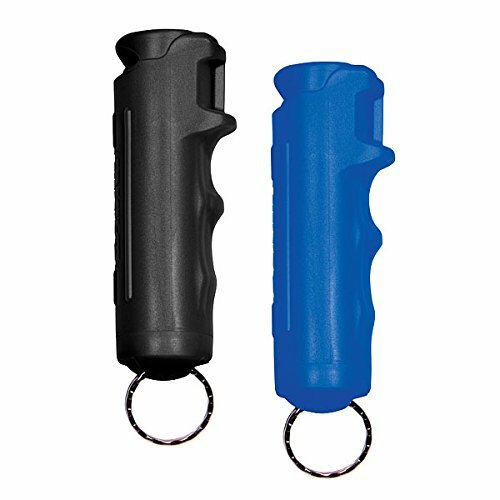 EASILY ACCESSIBLE WITH PROTECTION AT A SAFE DISTANCE AGAINST MULTIPLE THREATS - Key ring makes pepper gel easy to carry on the go while the ergonomic flip top safety prevents accidental discharge; finger grip enhances aim and product retention; contains 25 bursts (up to 5x other brands); includes FREE training video! If you have any questions about this product by SABRE RED, contact us by completing and submitting the form below. If you are looking for a specif part number, please include it with your message.